I keep meaning to write about this skirt because I'm so darn proud of it! 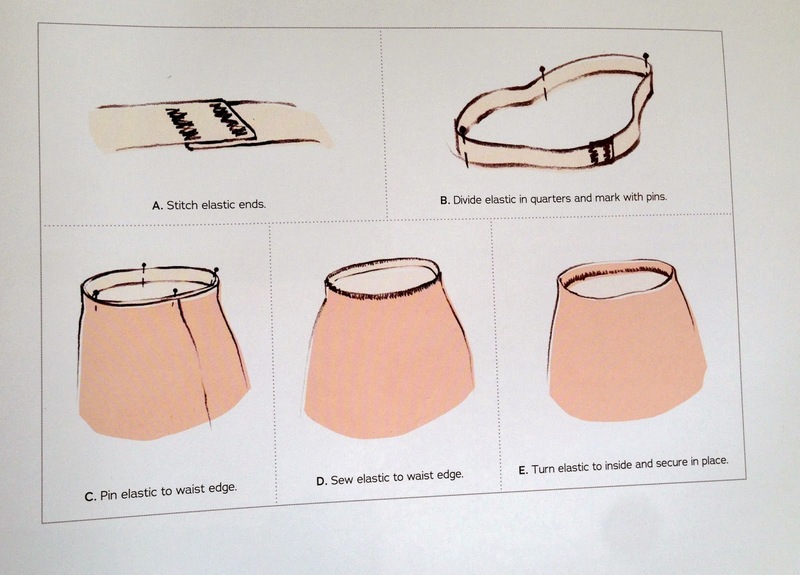 I made many prototypes trying to get to a casual wear version of a retro pencil skirt for my new book, Gertie Sews Vintage Casual. I knew I wanted it to be made out of a knit fabric with an elastic waist, but still have the structured look of a classic pencil skirt with a high waist and a tapered silhouette. 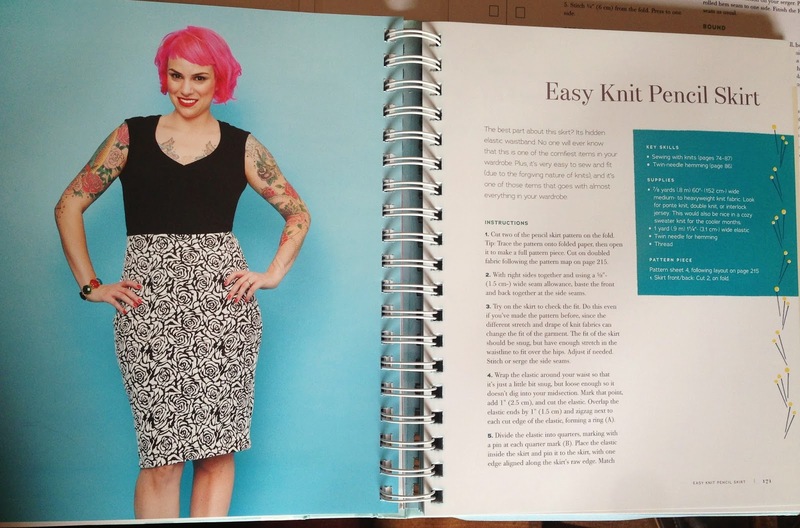 Many test versions later, I came upon this: the Easy Knit Pencil Skirt. For me, the real triumph is the hidden elastic waistband. It's smooth and lays completely flat so you don't get that sweatpant look around the middle. It looks cool on the inside, too. At first glance, it looks like a facing. But flip it up and you'll see the secret! 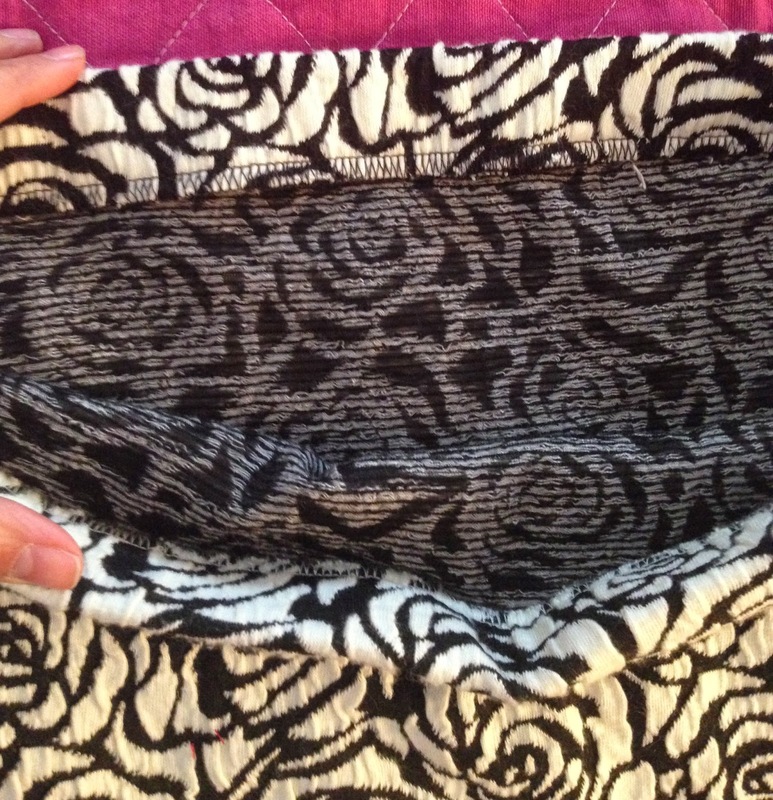 One of the reasons the skirt is so easy is that it just has one pattern piece: the skirt front/back. It has a cut-on facing. You serge or zigzag the elastic to the facing and then flip it in. 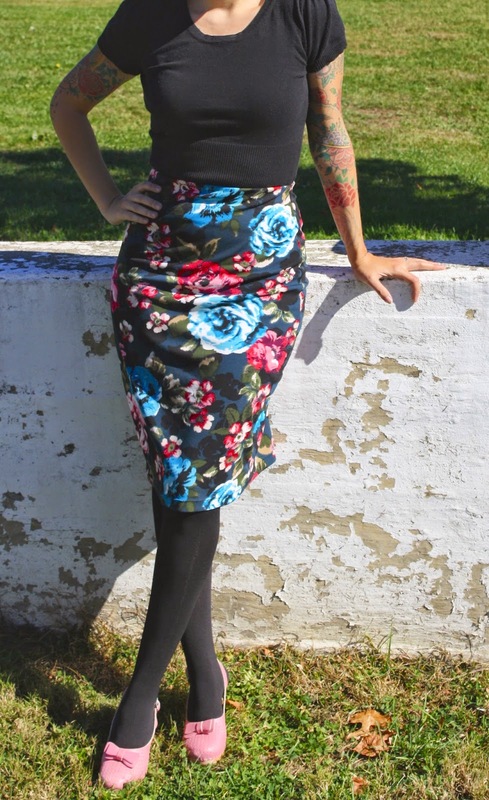 I've made several more of this skirt for myself, including this floral version. P.S. 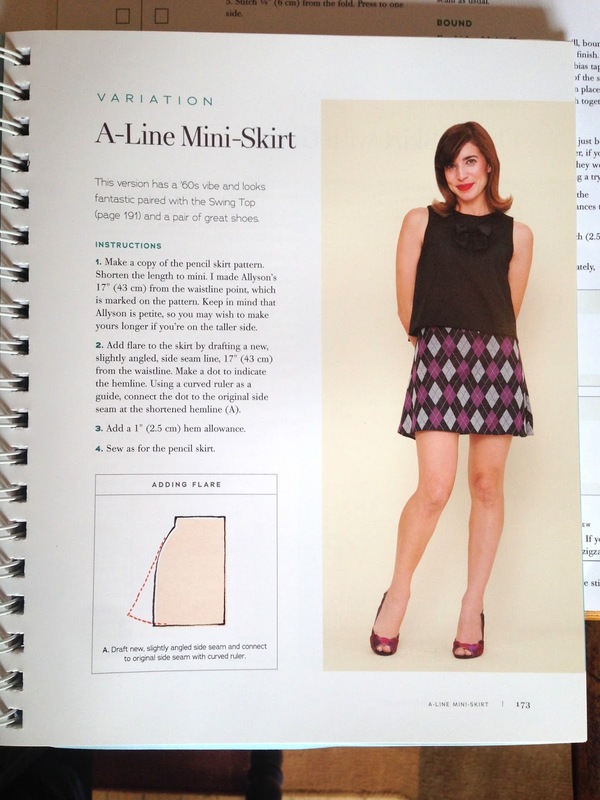 The book also has a '60s inspired mini skirt version and a '40s gored, flared version! That's a great waistband treatment. I learned it from Kwik Sew patterns back in the 90s and I've been using it ever since! So professional and easy! Kwik Sew in the 90s were so ahead of the game! I love this! And very timely, too, 'cause my daughter bought me your Vintage Casual book and we are making skirts together over her winter break! Thanks for this! love the skirts! I've heard rumors lol ! that pencil skirts look great on all body types yet I've yet to be brave enough to test that out on this 5 ft 1 pear shaped body thats slowly trying to merge into a grapefruit lol! Oooh, I love that skirt. I'm old school and I still haven't jumped into serging. Is that the best way to work with knits? It definitely is, Bobi! You can sew knits mostly with a serger, only using a standard machine for the hem or top stitching - the serger allows the seams to stretch with the fabric so they don't pop! Fabulous, cute and comfortable. Love your fabrics, are they fairly solid knits? Yes, that's my favorite elastic waistband, been using it for years! Cute skirt! I love the hidden elastic waistband. The fabric you chose is beautiful. Perfect skirt for my body type. I have the book and I've read through it but somehow I missed this technique. 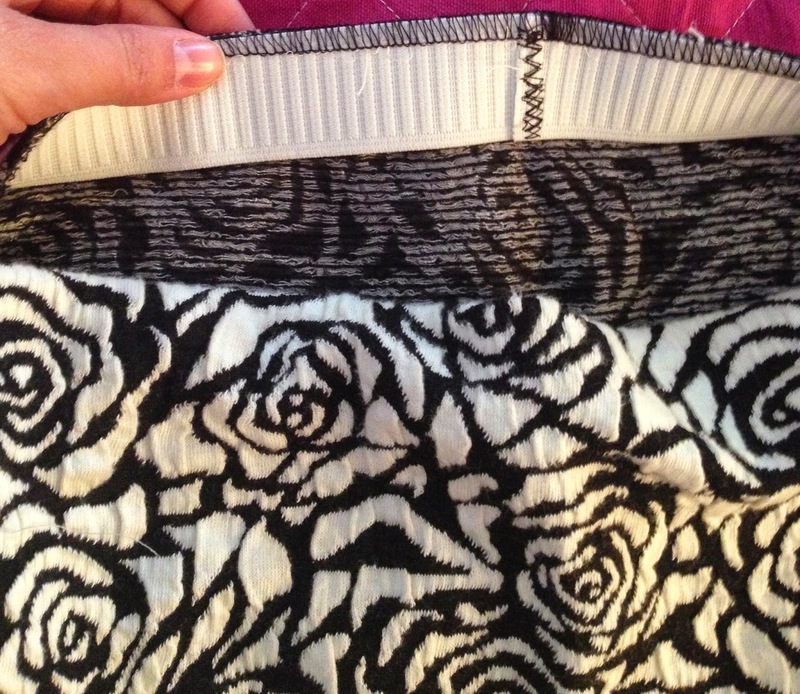 I love that it has sneaky non-elastic looking elastic at the waist! I'm definitely going to go back through and re-read that section. Now that it's winter time I'm starting to go into hibernation mode and that means I just want to wear all the comfortable things! I was going to say the exact same thing! How did we miss this cool technique? I know you like longer skirts, as do I, if you ever make a longer version, do post. Love it, very simple to make too. Looks gorgeous in the floral print. That huge floral is totally dreamy. Source? Great skirt! Style & comfort. You can't beat that! It looks so greate. Just what i want... tha book has to be under my christmas tree!!! Looks fab!! Just waiting for BOTH of your books to be delivered... Can't wait! I made this skirt the other day. The whole process took me about 45 minutes and I ended up with the most comfortable skirt I've ever worn. I am just writing up a review for it, but in the meantime I can happily recommend it. I love mine! This is one of the best tricks I learn and use as well. It makes everything fit great when I use it. Love that floral skirt, now I want one! The first project I made from this book. Easy to make and my new favorite skirt, I wear it so often. I love the floral print skirt! I'm so nervous about sewing with knits but this pattern is so adorable and looks fairly easy so I think I'll have a go at it. Wish me luck! I don't know if Gertie answers comments herself anymore but soneone else might know. Arethe patterns in the new book as long as the first? I made the pencil skirt from the first book and it came to almost my ankles, I had to take off six inches to get it to just below my knee. I am not particularly short either 5 foot 5. I made this skirt as the pattern directed and it came to my knees. I'm 1m63. Hope that helps! Hi Gertie. I bought both of your books the other day and am very excited. Perfect timing to see your post as I just start sewing knits. Can't wait to make one of these skirts soon. I love the floral print with your tats! OT - Does anyone know what happened to Gertie's Etsy shop? I received my book yesterday, so I had to make this skirt today. First time sewing with knit fabric. Boy have I been missing out! I actually managed to find a fabric nearly identical to the one in the book. The whole process from start to finish took about 45mins. I think it took longer to cut out the pattern than it did to make the skirt itself! Most comfortable skirt ever and the easiest pattern ever. Thank you for bringing this into my life! I see a closet full of these in my immediate future. I'm a beginner on this sewing thing. But I totally felt that I can do this! I have to try! And I need your book!! I'm trying to learn as much as I can about sewing.